This dish has a wonderful rich flavour, despite the low fat content. It can be put together the day before, then covered and placed in the fridge until needed. To make the meat sauce, put the beef, onion, carrot and garlic in a pan and cook over a medium heat, stirring, for about 5 minutes, until the meat is no longer pink. Spoon off any fat, but leave the juices. Add the tomatoes, tomato purée, red wine, oregano, bay leaf and seasoning. Bring to the boil, reduce to a simmer, cover and cook gently for 30 minutes. Meanwhile make the white sauce. Put all but 3 tbsp of the milk in a pan. Add the bay leaf and onion, bring to the boil, then remove from the heat and leave to stand for 15 minutes. In a separate pan, mix the cornflour with the remaining milk. Strain the infused milk into the pan and bring to the boil. Simmer for 2 minutes, stirring continuously, until thickened. Season and add nutmeg to taste. Remove from the heat. Preheat the oven to 190°C, gas mark 5. 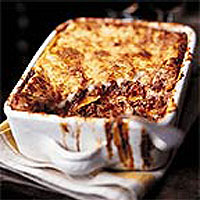 Cover the bottom of a medium-sized ovenproof serving dish with a single layer of lasagne sheets. Spoon on a thin layer of meat sauce, and cover with some of the white sauce. Arrange a layer of lasagne on top of this. Continue layering, finishing with white sauce. Sprinkle with the grated Parmesan. Bake for 20-25 minutes, or until bubbling and golden on top. Serve immediately with a salad or green vegetables. This recipe was first published in Sat Sep 01 01:00:00 BST 2001.